Info: The Samuel Nelson Law Office served as the home office for Judge Samuel Nelson. His estate was located across Lake Road and stood on the grounds once inhabited by James Fenimore Cooper. Nelson was a well-respected attorney and a U. S. Supreme Court Justice who rose to fame in 1856 with the controversial Dred Scott case. 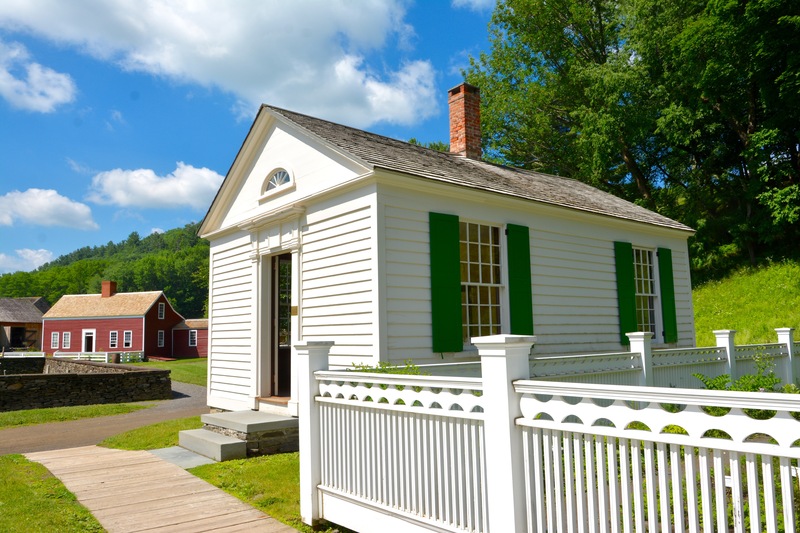 While he spent a considerable amount of time away from Cooperstown handling judicial matters, he always returned to his home and used this office during the summers. Provenance: The Farmers' Museum acquired the building from the Scriven Foundation in 1948. *The Scriven Foundation acquired the building from the Leatherstocking Corporation in 1944. *Leatherstocking Corporation was deeded the building by Stephen C. Clark in 1942. (The building sat on the Fenimore Farm from its purchase in 1876 until 1942. Sometime between 1876 and 1933 the building was moved across Lake Street by the Clark Family). *Ambrose Clark purchased the building and 300 acres from Catherine Nelson's estate in 1876. *Catherine Nelson acquired the property and building from her husband Samuel Nelson upon his death in December 1873. *Samuel Nelson bought the property the building was built on from Zina Wolcott Lay in 1829 for $3,212,50. He built the office the same year. *Zina Wolcott Lay bought the property from Abram Van Horne in 1827. *Abram Van Horne bought the property from R. Ledgewick in 1825. *R. Ledgewick bought the property from James Fenimore Cooper in 1818.